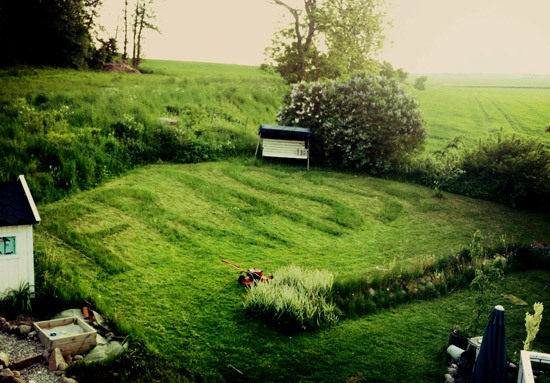 Jens and Viola wrote Frank´s nickname on our lawn. “FRASSE”. Love it. Viola wanted to write “HELP” but Jens talked her out of it. Also we finally bought some raspberry. I´ve been meaning to do so ever since we bought this house. genier – är vad ni är! Coolt! Är Violas byxdress från second hand? Super fin! Hej Linda! Ja den är från EBAY. The thought of having the word ‘help’ written om your lawn made me laugh out loud! ohoj, så fint och trädgårdslivet ser ljuvligt ut. kram. can I be your neighbor?? such a lovely photo! seriously -any houses for sale?? Thank you all for commenting on this.